At Euroclad Windows and Doors we’re proud to work with local home builders to provide them with a quality product that will last for decades. We often ask our customers what we can do to serve them better, as we know we can always continually improve our products and experience. 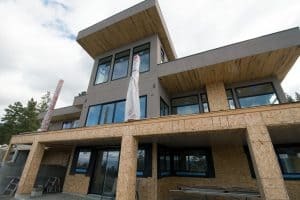 Okanagan Glacier Homes, one of the Okanagan’s premiere home builders, has used our products in their home builds for a decade. 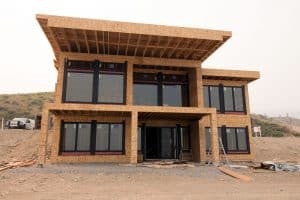 We sat down with Sara Anderson of Okanagan Glacier Homes to find out why they choose Euroclad Windows and Doors, and what keeps them coming back project after project. When did you first start working with Euroclad Windows and Doors? We started working with Euroclad in 2009. This was just after the housing market started to dip, and we were looking for local partners that would provide a quality product that would help our home construction projects really stand out. What initially attracted you to working with Euroclad? Local quality products were the number one reason. When building a home for a client, you want to deliver decades of reliability, and any problem with a product failing can mean a lot of hard work needs to be redone, and a major inconvenience for the home owner. We want our homeowners to love their home from day one. What types of projects do you work with Euroclad on? Residential new construction. Whenever we’re building a new house for someone we want to treat it like our own – and we’re not just saying that, we also use Euroclad products in our own home! Now that you’ve worked with them for a while, what do you like about working with Euroclad? The entire Euroclad team is absolutely great with our Customers. We know we can send a homeowner into their showroom and they’ll be well taken care of. They also have an excellent product selection, so you can bet the client will get exactly what they need. Is there anything Euroclad does to make your job easier? Just knowing that they are treating our Customers well makes everything easier. How do you feel about the staff there? Great! Owners Mike & Brigitte are simply wonderful people, and our personal sales executive always looks after the details. It’s really a worry-free experience. What does Euroclad do better than the competition? Overall, they just provide better products at a very competitive price. Our clients have a budget for their home build, and to be able to match them with a product that will perform well for a great price allows them to keep to their budget and get the home they want. Tell me a bit about the Euroclad products you use. We’ll use Euroclad for interior and exterior doors, metal clad windows, vinyl windows, custom front entry systems, and folding glass doors. When it comes to folding glass doors, Euroclad really is the best. I’m not sure you’ll find a better product on the market. What do your clients say about the final products in their home? Whenever we do a final walk through with a client before handing over the keys, they always mention how much they love the windows and doors. The quality shines through. Experience the exceptional products and service of Euroclad Windows and Doors yourself – drop by our showroom to find out how we can help you! © 2017 Euroclad Building Products Inc. Please fill out the below form to let us know how we can help you.